I don't believe I'd ever come across this. 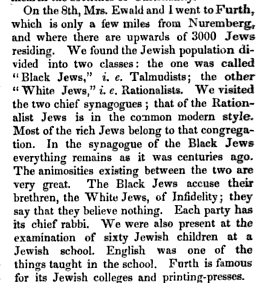 Has anyone else seen mid-19th century Orthodox or old-style traditional Jews in Germany referred to as Black Jews, and Reform Jews as White? From The Missionary Chronicle December 1846. I've never heard of this black and white classification in 19th century Germany. But you know that in Israeli Hebrew black hatters are referred to as שחורים. Call it what you will, the basic difference has been around forever. I would even classify the differences of the tannaim R. Meir and R.Shimon in the same vein.